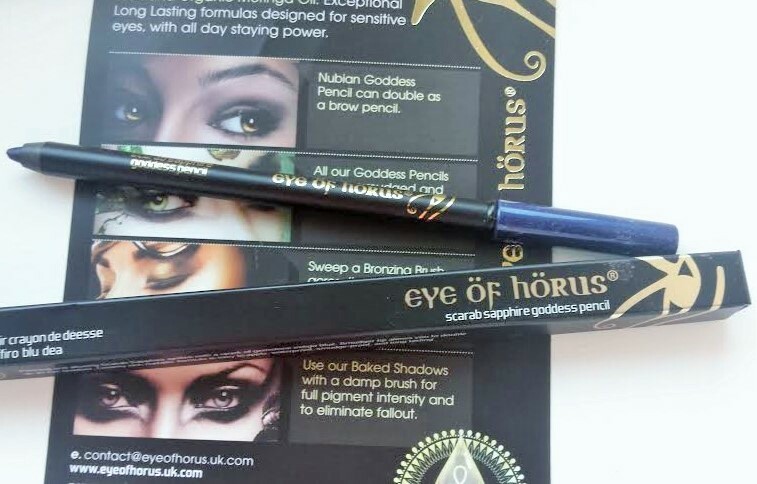 I couldn’t help but be intrigued when I was given the opportunity to sample the Eye of Horus Scarab Sapphire Goddess Pencil. I hadn’t come across the brand before and the mysterious look of the packaging and advertising made me want to know more. The Eye of Horus illuminating essential range of Goddess eye makeup is based on ancient Egyptian formulas and ingredients, including the revered Moringa Oil claimed by the gods for its beautifying and regenerating powers. After a few minutes of wear I was a bit disappointed to see that the colour had transferred to my eye lid – I’m guessing this is because my eye cream affected it and by lunch time there was significant fading. I suppose this is a lesson learned though and I’ve noticed with other products including mascara that oil based eye creams can cause problems. If you’re intrigued to find out more you can purchase the goddess pencils and more here. They retail at £17.00 which is a little more than I would expect to pay for a liner but I’m guessing that being a goddess is an expensive business!